Jewel appeared in Boston at The Borders Bookstore on Saturday, May 18th. In the Gallery sent to me from Jeff Smith. For times and exact points of reference for this broadcast Click here. At the party, Atlantic presented her with her first gold record for her debut Pieces of You. On May 15th, Jewel taped for 's 'House of Style' Prom Edition and was aired May 20th and throughout the following week. It's a shopping-w/-Jewel stint where the camera follows her around while she shops for Prom clothes she will never wear. Jewel taped 120 Minutes on Tuesday (April 23rd), and it aired the following Sunday (April 28th) at midnight. She performed several songs along with an interview. Jewel appeared on David Letterman on Monday, April 22nd and performed "Who Will Save Your Soul." Like other musical guests on the Late Show, her performance was slotted at the very end of the show with no time for talking. I have a few pics in the Gallery. 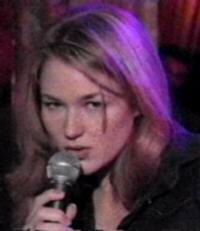 Jewel appeared on Good Morning America on February 12 performing "Who Will Save Your Soul." Check out some shots from the show. Duet anyone? Jewel answered that question posed last fall by Melissa Etheridge and the result was something to watch . . . Over and over again on VH1 Duets. Melissa performed with Joan Osbourne (Bring Me Some Water & St. Teresa), Paula Cole (Occasionally), Jewel (You Can Sleep While I Drive & Foolish Games) and Sophie B. Hawkins (Damn, I Wish I Was Your Lover). Guess who stole the show? Don't miss it. . . again. Jewel played the lead in a TNT production of The Wizard of Oz last Thanksgiving Eve which was also aired an additional five times just afterward. The number to order Wizard of Oz merchandise is 1-800-201-8844.